The following describes a new theoretical article that I am developing on the brain basis of thought and consciousness. It is an outgrowth of a previously published article that can be found here. As the stream of thought progresses through time some elements stay the same. Of course, elements are always being added to and subtracted from the stream of thought but working memory ensures that some of these concepts are held online temporarily. This maintenance function keeps your train of thought from being derailed and makes it so that what you are thinking at this moment is highly related to what you will be thinking one second from now. This interrelatedness of consecutive thoughts provides the fabric of consciousness and allows thought to progress. The maintenance of working memory is made possible by a cellular phenomenon called sustained firing. Sustained firing happens when a neuron is signaled by dopamine to fire repeatedly over the course of several seconds. This type of neural activity happens in neurons in the higher brain areas (i.e. 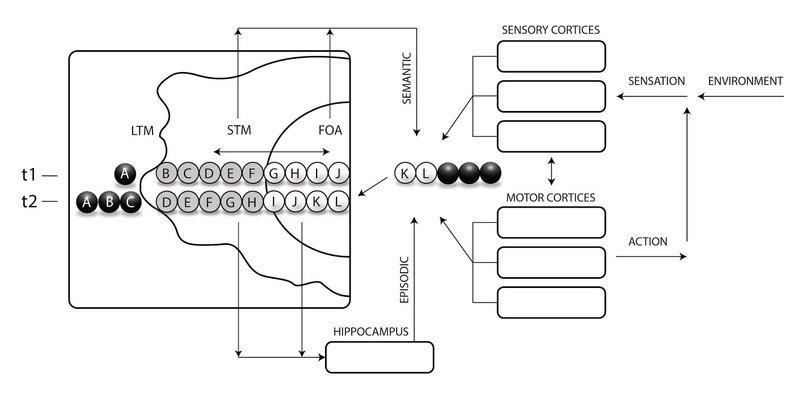 the prefrontal and parietal cortices). Sustained firing is what allows us to keep important concepts in mind so that we can manipulate them, reason with them, and think about them. Without sustained firing we would continuously forget what we were just thinking. We wouldn’t be able to think or reason. This continuity of neural activity allows us to build chains of logical thoughts that progress toward a solution or plan. Now let’s consider the concept of iteration. I organized this article around the term “iteration.” I think that iteration is easy for people to understand because everyone is aware of the concept of product development. Personally, I think of the iPhone iterations. The customer feedback and R&D on the iphone 7 is combined with some of the original features of the iphone 7 to create the newest iteration: the iphone 8. In a similar way the computational products of the previous thought are combined with some of the original elements of that previous thought to create the next thought. I think the word "iterative" captures the meaning of “incremental change” and is a good word to describe the model. 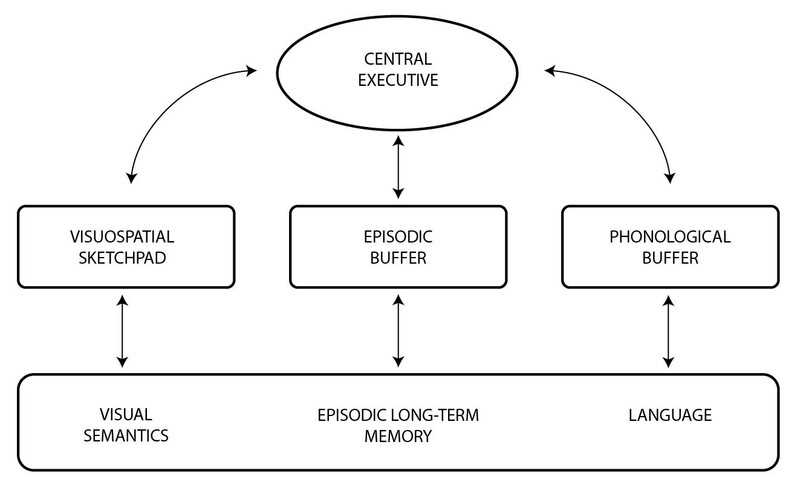 The article addresses the role of iteration in the processing stream of working memory. This is a concept that has not been addressed by contemporary cognitive science. As the article documents, it was considered by William James over 100 years ago. The article describes how, when working memory is updated, elements from the previous state remain active due to sustained firing. This ensures that each state of working memory is a revised iteration of the state before it. This pattern of iterative updating is discussed in detail and it is related to a large number of cognitive and neuroscientific phenomena. The model views working memory as activated long-term memory. It features a brief sensory store, and an FOA (focus of attention) embedded within a STM store, which in turn is embedded within LTM. Instead of focusing on stimulus reception and the controlled and automatic responses to incoming stimuli, it focuses on ongoing activity within working memory, the repeating iterative pattern inherent in it, and the search and selection of new items to be added to working memory. 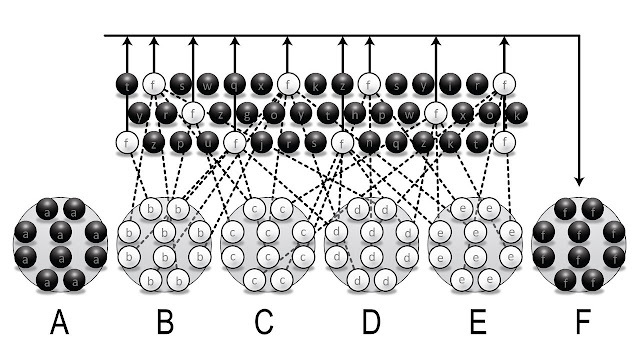 The model views each instantaneous state of working memory as two things: 1) a set of solutions to the last state’s search, and 2) a set of parameters for the next search. 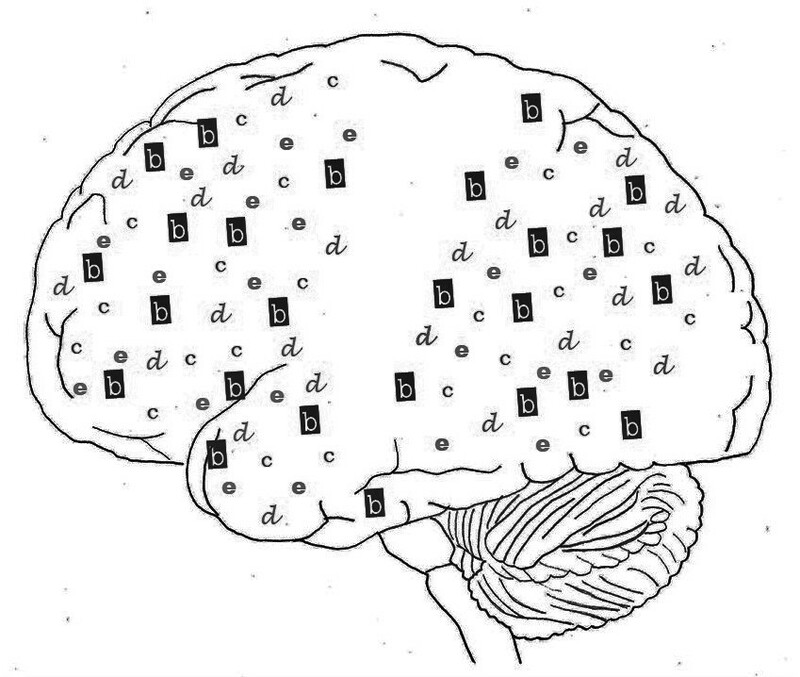 The active items in working memory spread their activation energy throughout the brain to select the next ensembles to be added to working memory. This is how “search” is performed. I suggest that iteration is fundamental to working memory in that it allows context to be carried from one brain state to the next. This recursive property is instrumental in implementing learned algorithms, in allowing mental continuity (interrelatedness of consecutive mental states), and creating progressive changes to the contents of working memory. Please take a look at the figures below. These original figures are helpful in conveying the model. This model depicts environmental stimuli being received by the senses and held in sensory memory. If attended, this stimulus information will enter short-term memory (working memory). If it is not rehearsed, it will be forgotten; if it is rehearsed, it will remain in short-term memory; and if elaborated upon sufficiently, it will be stored in long-term memory from which it can be retrieved later. 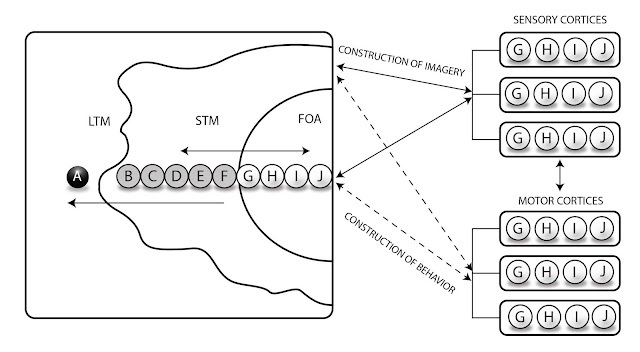 In this model the short-term store from the Atkinson and Shiffrin model is split into four interacting components that control working memory activity: the visuospatial sketchpad; the phonological buffer; the central executive; and, added later (Baddeley, 2000), the episodic buffer. 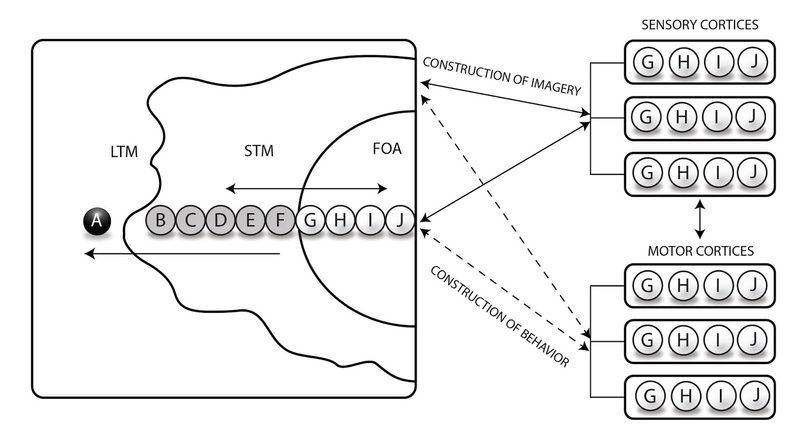 These components interact with long-term memory, represented by the bottom rectangle. Short-term storage is an activated subset of long-term storage, and the FoA is an attended subset of short-term storage. Habituated stimuli enter the short-term store but do not enter the FoA. Each arc, designated by a lower-case letter, represents the active time span of a neuron exhibiting sustained firing. The x-axis represents time. Dashed arcs represent neurons that have stopped firing, whereas full arcs denote neurons that have not yet stopped firing. Items are designated by uppercase letters. White spheres indicate active items and black spheres indicate inactive ones. In time 1, item A has already been deactivated, and B, C, D, and E are coactivated, echoing the pattern of activity shown in Figure 4. When coactivated, these items spread their activation energy, resulting in the convergence of activity onto a new item, F. At time 2, B has deactivated; C, D and E have remained active; and F became active. At time 3, D exits the FoA before C indicating that the order of entry does not determine the order of exit. As with other figures in this article, this figure is an emblematic abstraction. Repetition of a computational procedure applied to the product of a previous state, used to obtain successively closer approximations to the solution of a problem. A mechanism dedicated to maintaining selected representations available for use in further cognitive processing. 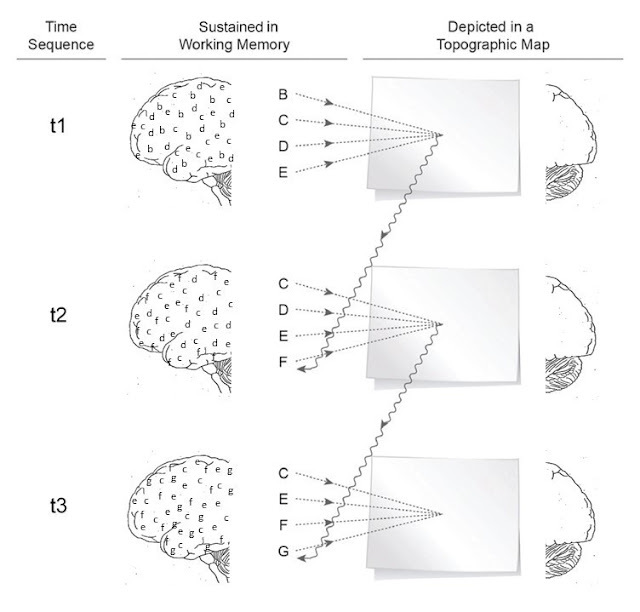 Changes in the contents of working memory occurring as processing proceeds through time. 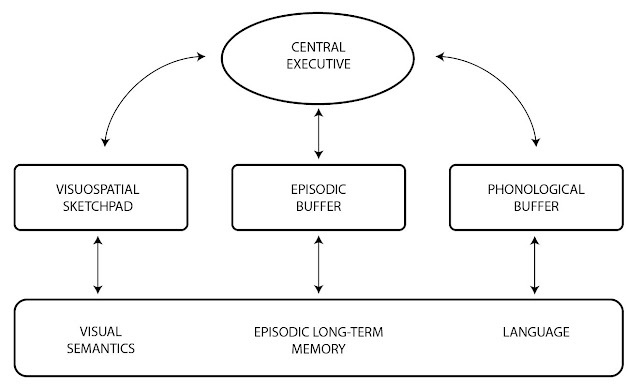 A partial shift in the contents of working memory that occurs during updating as some contents are added, others are removed, and others are repeated. In the first transition at time 1, there are four active items (white spheres). 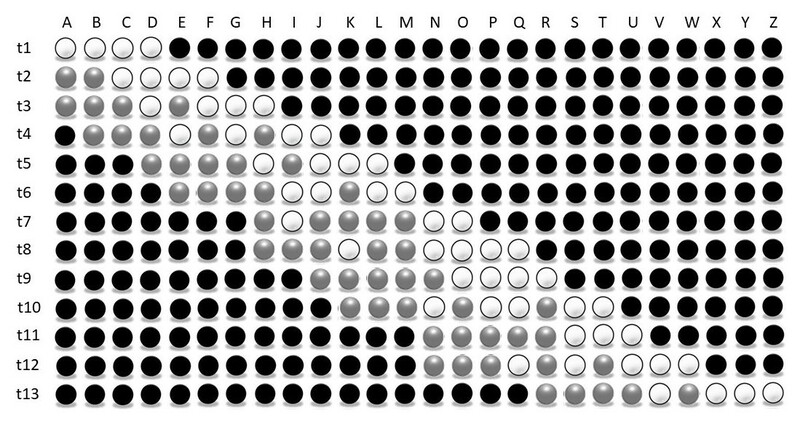 In time 2, one of these four items has been replaced (1/4); that is, one white sphere becomes black (inactive) and a different black sphere becomes white (active). Thus, 25% of items have been updated between time 1 and 2 without any change in the total number of active items. Other figures in this article feature this 25% updating; however, in a store with four items, updating can occur in three other ways. 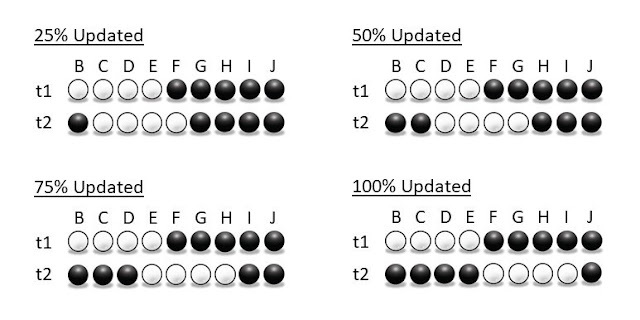 The other transitions in this figure depict 50%, 75%, and 100% updating. 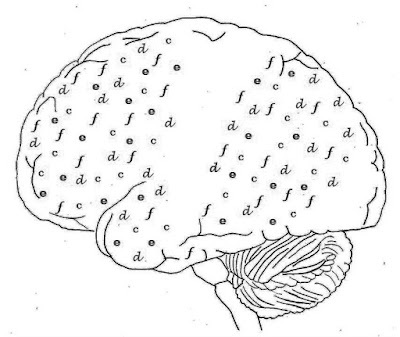 The engrams for attended items of information B, C, D, E and F are each composed of many assemblies of neurons (represented by lowercase letters) active in association areas. In time 1, the assemblies for B, C, D, and E are active, whereas in time 2 the assemblies for C, D, E and F are active. Time 2 is an iterative update of time 1. Spreading activity from each of the assemblies (lowercase letters) of the four items (uppercase letters) in the FoA (B, C, D, and E) propagates throughout the cortex (represented by the field of assemblies above the items). This activates new assemblies that will comprise the newest item (F) to be added to the FoA in the next state. 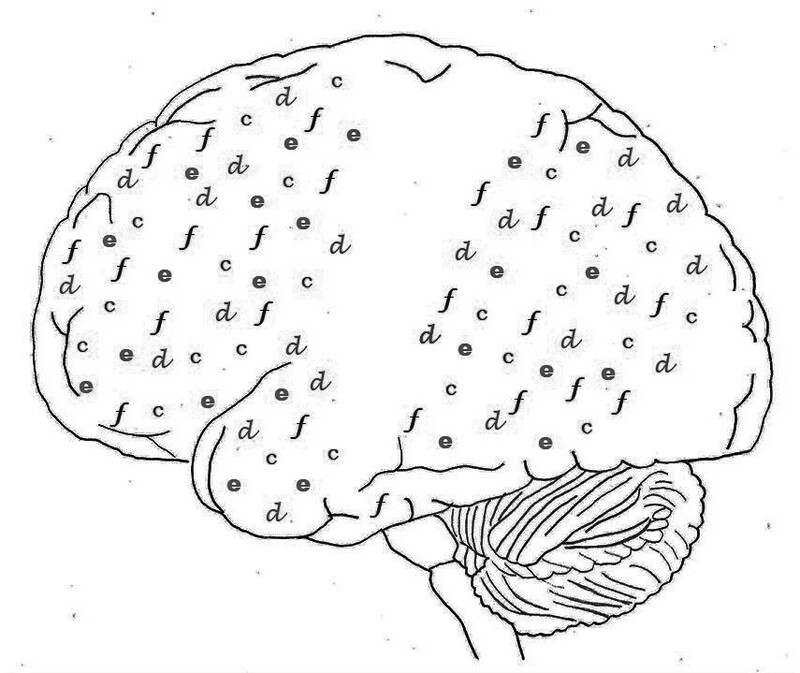 The assemblies that comprise items B, C, D, and E are each individually associated with a very large number of potential items, but, as a group, they are most closely associated with item F.
The FoA, the short-term store, and the hippocampus, as well as sensory and motor cortices, all contribute to the spreading activation that will select the next item(s) from long-term memory to be added to working memory. At time 1, two (K and L) of a potential five items are converged upon and will update the FoA in time 2. Five items are shown in gray within the short-term store but in actuality this store can hold many more. In time 1, items B, C, D, and E, held active in association areas, all spread their activation energy to early visual cortex where a composite topographic map (sketch) is built that is based on prior experience with these items. 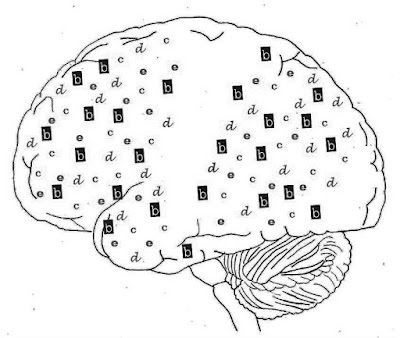 In time 2, salient features introduced by the map from time 1 spread activation energy up the cortical hierarchy converging on the assemblies for item F. B drops out of activation, and C, D, E, and F diverge back onto visual cortex. The process repeats creating a progressive series of related images. Each horizontal row is a snapshot of items coactive in the FoA at a specific time period. An original problem is activated, and iterative updating is used to reach a subsolution. This subsolution is saved in the short-term store, and a related subproblem is introduced into the FoA. This subproblem iterates until a second subsolution is generated. Relevant items from the first subsolution are combined with those from the second subsolution and iterated to generate a final solution. Iteratively updated items in working memory interact with sensory cortices to construct progressive mental imagery and interact with motor cortices to construct progressive behavior. In the next state, the items in the FoA will undergo partial replacement. The parameters used in sensory and motor cortices will reflect this change making their output an advancement on their previous output. 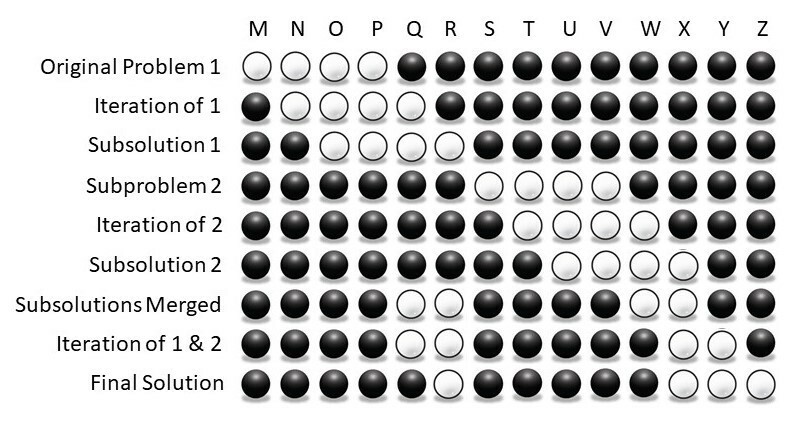 This graphic expands on Figure 13, incorporating a larger number of the present model’s theoretical features: 1) the number of items coactive in the FoA (white spheres) at any one point in time varies between three and five; 2) the percentage of updating in the FoA varies between 25% and 100%; 3) items that have exited the FoA are capable of reentering the FoA; 4) the order of entry into the FoA does not determine the order of exit; and 5) items that exit the FoA briefly enter the short-term store (gray spheres) before deactivating completely (black spheres). 1. Items of working memory correspond to temporarily activated groups of neural assemblies that encode long-term memory information. 2. These items enter the FoA from which they move toward unattended short-term memory and then into inert long-term memory. 3. Items remain active in working memory as long as their neural components demonstrate persistent activity in the form of sustained firing (FoA) or synaptic potentiation (non-FoA short-term memory). 4. 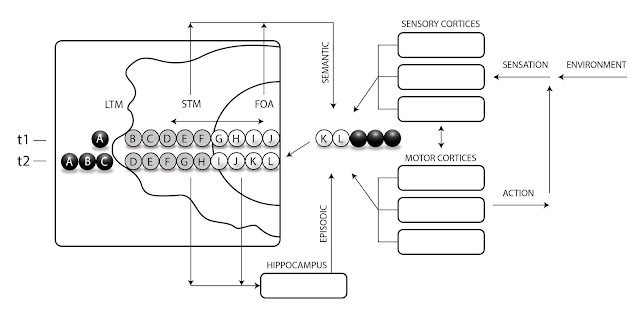 The active items in the FoA and the short-term store serve as search parameters for the next additions to working memory by spreading their activation energy throughout the cortex. 5. The newly activated items of working memory are added to the remaining active items from the previous state to form an updated set of search parameters. 6. This iterative updating process ensures that the next search is not an entirely new search but rather a modified version (updated iteration) of the previous search. 7. Iteration may allow progressive modification, implementation of learned algorithms, and mental continuity.